2Market Information Inc., publisher of Industry-Sponsored Research Management newsletter, has entered an affiliation agreement with University Industry Demonstration Partnership to provide access to the publication for all UIDP’s institutional member representatives. Launched in March 2017, Industry-Sponsored Research Management is the first and only how-to newsletter designed to help universities attract more corporate-sponsored research and manage those partnerships effectively. Not-for-profit UIDP is the leading membership organization for corporations and universities seeking to address issues impacting academic-industry collaboration and find better ways to partner and maximize their investments in those collaborations. Under the affiliation agreement, all of UIDP’s member representatives will gain access to the publication via the organization’s members-only web portal, beginning with the January 2018 issue. Industry-Sponsored Research Management will continue to be offered to non-UIDP members on a subscription basis. UIDP President Anthony Boccanfuso, commenting on the affiliation, noted that it is part of the organization’s continuing efforts to provide more value for members, and more guidance and tools for encouraging and enhancing university-industry partnerships. To learn more about Industry-Sponsored Research Management and request a sample issue, click here. The UIDP comprises many different perspectives and one focus: improving University-Industry (U-I) partnerships. It is a unique project-oriented forum where representatives from academia and industry seek opportunities to develop new approaches to working together. UIDP membership comprises some of the finest innovation companies and best research universities in the world: organizations committed to active participation in pursuit of excellence in U-I collaboration and partnership. Members of UIDP don’t just talk about problems, they solve them. For further information on membership, go to www.uidp.org. Atlanta-based 2Market Information Inc., publisher of both Technology Transfer Tactics and Industry-Sponsored Research Management, is the world’s leader in providing practical guidance and professional development for technology transfer and research commercialization professionals. Along with these publications, the company’s offerings include webinars, books, distance learning collections, e-zines, software, and other tools available in print and electronically through the Tech Transfer Central web portal. To learn more about its products and services, go to www.techtransfercentral.com. The May issue of the all-new publication Industry-Sponsored Research Management offers an inside look at two alternative contracting models designed to be more attractive to corporate sponsors than standing sponsored research agreements. The two programs were developed by two different Oregon universities — Oregon State and the Oregon Health and Sciences University. They share a common goal: To overcome common barriers to industry-sponsored research deals using simpler contract terms and easier access to intellectual property developed under the agreements. Those terms, their implementation, and their impact are detailed by research management leaders at each institution. Michigan State University’s Business-CONNECT program offers a “front door to corporations” and takes a holistic approach to corporate engagement, stimulating both research funding as well as economic development in the region. Members of a research consortium in the Philadelphia area, led by the Wistar Institute, have all pledged to use a standardized sponsored research agreement that will cut the time and effort involved for industry partners. John Deere Co. has opened its own office on the Iowa State University campus as a way of “embedding” into the fabric of the research institution and building closer ties to faculty innovators. The Michigan Corporate Relations Network was recently expanded to include all 15 state universities, all working to help companies with everything from finding interns to building fruitful research partnerships. Launched last month by Atlanta-based 2Market Information Inc., Industry-Sponsored Research Management is the first and only publication devoted to helping universities build and manage their portfolios of corporate-sponsored research agreements. Each monthly issue contains high-level strategies and best practices designed to help research managers bring in more industry research contracts, negotiate deals effectively, build lasting relationships with corporate sponsors, protect valuable intellectual property, avoid conflicts of interest, and ensure airtight compliance practices. For complete details on the publication and a special discounted charter subscription offer, CLICK HERE. Atlanta-based 2Market Information Inc., publisher of Technology Transfer Tactics, is the world’s leader in providing practical guidance and professional development for technology transfer and research commercialization professionals. To learn more about its products and services, go to www.techtransfercentral.com. 2Market Information Inc., publisher of TechnologyTransfer Tactics newsletter and Tech Transfer eNews, and producer of distance learning programs for technology transfer professionals, has announced the launch of Industry-Sponsored Research Management, the first and only how-to newsletter helping universities attract more corporate-sponsored research and manage those partnerships effectively. This monthly publication is a single source of how-to, practical information focused squarely on providing industry-sponsored research managers with high-level strategies and best practices guaranteed to bring in more contracts, negotiate deals effectively, build lasting relationships with corporate sponsors, protect valuable intellectual property, and ensure airtight compliance practices. “The squeeze on research funding from traditional government and other grant sources is something every university has been dealing with, and many have turned to lucrative industry-sponsored collaborations to replace or supplement that traditional funding,” says David Schwartz, 2Market Information’s CEO and publisher. “There are tens of millions of dollars involved, critical intellectual property issues, difficult contracting and negotiation challenges, and very tricky conflict of interest concerns – yet there has been a near-total absence of in-depth, practical coverage of these challenges. We aim to change that,” Schwartz states. Charter subscribers to Industry-Sponsored Research Management will also receive a free distance learning collection, Best Practices in Forming and Managing Industry-University Partnerships. It includes three programs that tackle some of the toughest challenges faced in the industry-sponsored research arena. For a free copy of the premiere issue, CLICK HERE or call 239-263-0605. For further information on the publication or to become a charter subscriber for just $297 (a $100 discount), plus receive the three-program distance learning collection Best Practices in Forming and Managing Industry-University Partnerships, CLICK HERE. Atlanta, GA – PRWEB – December 16, 2013 – Tech Transfer Central, the world’s leading provider of information, news, publications and online learning for technology transfer and intellectual property professionals, is pleased to announce that it has expanded its sponsorship and advertising solutions to better serve the marketplace. This new offering features: content-driven lead generation tools; unprecedented access to research commercialization, licensing and tech transfer professionals; and co-branding opportunities across Tech Transfer Central’s content and media outlets. Click here for more information. Owned by 2Market Information, Inc., Tech Transfer Central is the home to leading publications, including: Tech Transfer eNews, Technology Transfer Tactics and Tech Transfer University Reporter. Readership includes more than 150,000 decision makers in universities, labs, research facilities, law firms, investment and consulting firms, tech incubators, government agencies, corporations and other entities that have a stake in tech transfer or research commercialization. Schwartz cites several ways the company is expanding its promotional opportunities. The first is by increasing the number of advertising vehicles. The second is by tapping into the company’s vast archive of content to supply clients with webinars and whitepapers that will optimize lead generation. And the third is by offering Bundled Advertising Options that enable clients to utilize multiple media channels at reduced rates for maximum exposure. Tech Transfer Central now has seven outlets that advertisers can leverage to support their marketing efforts. The company’s e-mail, website and e-newsletter advertising are now complemented by webinar management or sponsorship, white paper sponsorship, and a highly trafficked job listing page where universities and companies can advertise job openings. In addition, customized and bundled advertising and promotion options are available to meet a company’s needs and supply the design and production support needed to execute on a successful marketing campaign. View the media kit. High-quality targeted content is an integral part of the marketing strategy for most companies. Tech Transfer Central has answered that need with two new programs – custom webinars and custom white papers. In addition to managing your webinar, we can tap into our vast industry expertise to help our advertisers develop program topics as well as line up the speakers and provide top-notch back-end support with our in-house webinar team. Tech Transfer Central also has the content and editorial expertise to develop white papers for companies on the topic of their choice. Co-branding can also be leveraged by webinar and white paper advertisers, which can result in higher performance campaigns to Tech Transfer Central’s loyal subscriber lists, which reach more than 150,000 top-level decision makers in the research commercialization community. For more information on the advertising and sponsorship options offered by Tech Transfer Central, visit TechTransferCentral.com or download our media kit. ATLANTA — 2Market Information Inc., publisher of Technology Transfer Tactics, has launched a new web portal – TechTransferCentral.com. The new site is designed to be a one-stop destination supplying information, news, products, and services for technology transfer and intellectual property professionals. In addition to Technology Transfer Tactics, the world’s most widely read and respected independent publication for tech transfer professionals, the company also publishes the free weekly online publication Tech Transfer eNews. In addition, its Distance Learning Division produces more than 30 interactive webinars each year and has compiled an archive of nearly 200 recorded programs, all available on demand. The company also offers a variety of books and reports and has partnered with other information providers so that a broad array of resources for tech transfer, licensing, legal, and other professionals could be offered in one place. These resources include royalty rate and IP valuation references, patent law guidebooks, valuation and technology assessment software and tools, market research reports, TTO benchmarking resources, certification programs, directories, and databases among others. The site also features weekly specials on selected products, a selection of free webinars and online resources, a searchable archive of Tech Transfer eNews articles, a tech transfer jobs page with positions available, and a free, continuously updated university-specific search engine of patents issued. To visit the site, go to www.techtransfercentral.com. 2Market Information Inc., publisher of Technology Transfer Tactics newsletter and producer of distance learning programs for technology transfer professionals, has announced a system-wide license agreement with The Research Foundation for The State University of New York (RF). The agreement enables the RF to provide commercialization staff across the entire State University of New York (SUNY) system access to Technology Transfer Tactics’ monthly issues, an archive of all previous issues of the publication, all current distance learning programs, more than 150 archived distance learning programs, and other valuable content. Through its publications and webinars, Atlanta-based 2Market Information Inc. has become the leading independent information provider for tech transfer and research commercialization professionals worldwide. RF and SUNY join a number of other renowned institutions taking advantage of site license agreements to make Technology Transfer Tactics’ unique, practical information on improving the results of commercialization activity available to their key tech transfer and licensing staff. In addition, with 2Market Information’s extensive schedule and archive of distance learning programs, SUNY staff will have access to targeted training programs presented by experts on a wide variety of specific challenges and opportunities for university technology transfer offices. Additional organizations with Technology Transfer Tactics site license agreements include Columbia University, Exploit Technologies (Singapore), Wisconsin Alumni Research Foundation, University of Texas system, PNNL/Battelle, Johns Hopkins University, MRC Technology (UK), and Howard Hughes Medical Institute, among others. 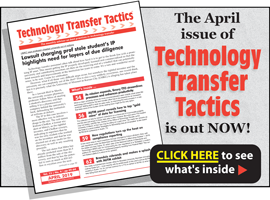 For more information, please visit www.technologytransfertactics.com. To discuss a site license for your organization, contact David Schwartz directly at dschwartz@technologytransfertactics.com, or 404-626-8191. 2Market Information Inc., publisher of Tech Transfer E-News, has received approval of its entire Distance Learning catalog by Certified Licensing Professionals, Inc. for continuing education (CE) credits. These programs are comprised of more than 50 live and on-demand audioconferences and webinars (available on CD, DVD, MP3 and as PDF transcripts) encompassing a wide array of topics related to IP licensing and the technology transfer process. For a complete listing of our CLP-approved distance learning programs, CLICK HERE. Company CEO David Schwartz states, “We are honored to be bestowed with the Certified Licensing Professionals CE approval. This distinction is a tribute to our distance learning products’ outstanding quality, cost-effectiveness and convenience. Historically, our programs have been well-attended by licensing professionals, and this new certification approval adds even more benefit to the programs — not only for certified licensing professionals, but to everyone guiding the transfer of IP from the lab to marketplace.” If you are a licensing professional but have not yet become certified, click here for details on how to pursue your CLP certification. AURIL (Association for University Research and Industry Links), Europe’s largest organization for knowledge transfer professionals (a field also known as “technology transfer”), has signed a multi-year Memorandum of Understanding with Technology Transfer Tactics (TTT), a Florida-based publisher of continuing professional development content on the commercialization of university research. The agreement highlights AURIL’s recognition that TTT-produced materials (newsletters, audioconferences, books) “can have educational value to knowledge transfer professionals,” and provides a mechanism for AURIL members to obtain these resources at discounted prices. “We feel this formal arrangement with TTT will provide a wider range of practical, easily-accessible knowledge transfer information for our members,” said Dr. Phillip Graham, AURIL’s executive director. “It will also provide them financial savings in today’s stressed economy,” he added. Both groups will cooperate in publicizing this new arrangement to AURIL members. Originally established in the 1980s, AURIL has over 1600 members, located primarily in the UK and Ireland, and is acknowledged as the largestknowledge transfer association for practitioners in organizations engaged in knowledge transfer. TTT is a privately held information publishing company, founded in 2007 by David Schwartz and Dr. Leslie Norins. Their combined experience in scientific publishing exceeds 50 years. Its educational product line includes two monthly newsletters by subscription, two free weekly e-zines, and numerous audioconferences, special reports and books. Both TTT and AURIL share the common objective of stimulating the rapid, effective transfer of knowledge and technologies between universities and research institutes and the commercial marketplace — and thereby into use by society. This process is facilitated by specialized staff who convert research discoveries into practical applications, often involving the return of licensing royalties back to inventors and to universities for further re-investment. For further information: www.AURIL.org.uk and www.technologytransfertactics.com.